I’m doing an extremely bad job of keeping the site fresh over the last few months or so. I figured I’d give a quick update of things going on. I finally started the Step 3 of the Nicoderm CQ program. This one has been rough. This is where you really start physically feeling the consequences of nicotine being removed from your system. I’ve been completely exhausted for the last week. Apparently, that there nicotine is one powerful stimulant and really screws with your metabolism. Your body takes some time to equalize itself and get itself back to where it needs to be naturally. I’m hoping mine gets there soon – because I’ve not had a good time over the past week. The interesting thing about these “stop smoking aids” is that they defer you dealing with the real issue until you have so much skin in the game that you can’t start again without feeling an intense feeling of failure. Brilliant, but I can tell you that first step gives you an overly simplified view of what it takes to quit smoking. It starts getting a little harsher at step 2 and now at step 3 you really start PHYSICALLY feeling it. The only thing worse will be when Step 3 is over and my body starts eliminating nicotine all together. Like I said though, I have too much skin in the game now to restart – I think. Jonna bought me an iPhone for our anniversary, and I have to say that aside from the GPS she got me for Christmas, which allows me to go out by myself and still be able to get home, it is about the coolest thing for me from a productivity perspective that we have added to my highly disorganized life. I’m finally able to get all my contact information in one place where it is accessible at any time. I can take notes, I can look things up on the web and I can check personal email. From a browsing perspective, I can get to things that are a part of my life but are blocked at the firewall at work (which is great as well). I feel free. Now, it hasn’t been without its problems. The 1.1.3 software that came with the phone dropped a lot of calls. It wound up pretty frustrating and I kept my work supplied cell phone so that I could actually hold calls without them getting dumped. The 1.1.4 update took care of this though and now it works like a real phone. I love the contact management included in the phone. Support for multiple numbers per contact and custom labelled information (including notes) lets me keep track of all the information I could ever want about someone. I can even attach a picture. Integration with the Mac Address book allows me to keep my contacts up to date without having to type into the phone. Overall though, I think between the GPS for Christmas and the iPhone this month, I’ve received the two most useful (and really most used) gifts ever. As an aside, for those who are obsessed with not scratching or smudging their iPhone or other Apple products, Jonna also picked up a skin called Best Skins Ever for both Kelsi and myself, which we applied a couple of weeks ago. Kind of scary at first (you need to use water to apply it), but they really are the best skins ever. You don’t even know they’re there. I’m definitely going to pick up one for my iPod, as soon as I get a round tuit. Well thats it from the Labs for last month. I’m sure as the weather starts to warm and the nicotine continues to seep out of my system, I’ll have more energy to blog about useful things. 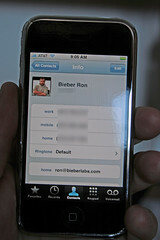 This entry was posted in Digital Life, Technology and tagged apple.iphone, Quitting Smoking, Technology by Ron Bieber. Bookmark the permalink.